They are, however, losing one of their more popular programs, "A Prairie Home Companion," basically because it costs an arm and a leg to air. Garrison Keillor, who has announced he'll be retiring in 2013 and is cutting back in the meantime, does a double-dip charging stations who run his show a fee for his American Public Media syndicate on top of the fee for the show. Dropping that one program will mean $21,000 savings. They're also dropping another Saturday show, "Mountain Stage," replacing it with some similar-style syndicated music programming. Another big shift is one only night owls will notice: BBC World Service and BBC Newshour have filled a weekday block from 2-6 a.m. (except Fridays when it started at 3) since some time after Oregon-based Jefferson Public Radio purchased the local BBC outlet KZPN. The BBC shows will be replaced with an hour of assorted talk radio at 2 (including the full hour version of the locally produced "A World of Possibilities" on Thursdays), followed by an extra dose of NPR's Morning Edition, which under the new schedule will run from 3-9 a.m. M-F. There are other changes (Sista Soul finally gets a full 2 hours), but we'll let KHSU's press release explain them for now. It's followed by a handy FAQ they prepared in advance (since no one but KHSU programmers knows about the changes, the questions are presumably assumed), and a look at the new grid, which BTW, does not take effect until July 1. Public radio station KHSU will make some changes to its programming starting July 1. Most of the significant changes are being made to trim a budget hit by cuts in state funding and other revenues. The most notable changes will affect weekend programming. "A Prairie Home Companion" and "Mountain Stage" will be cancelled and other programs will shift on Saturday and Sunday. The other major change will eliminate the "BBC World Service" from the very early weekday morning line-up. The NPR's "Weekend Edition," currently a two-hour program starting at staggered times Saturday and Sunday will be expanded to three hours. Weekend Edition will now start at 7 a.m. both days and air until 10 a.m.
Due to that change, other programs will shift. On Saturday, "Car Talk" and "Wait Wait...Don't Tell Me" will air an hour later at 10 and 11 a.m., respectively. On Sunday, the "Conscious Contact Gospel Hour" will start an hour earlier at 5 a.m. The station will also add a repeat performance of "Wait Wait...Don't Tell Me" on Sunday at 10 a.m. to give listeners a second chance to catch the popular news quiz show. "These are two shows our listeners have enjoyed over the years, but they also come with a noticeable price tag. "A Prairie Home Companion" is the most expensive entertainment show on our schedule, totaling more than $21,000 in program and affiliation fees." Subkis added that a six-month appeal seeking listener support specifically for "Prairie Home" did help pay its cost for this fiscal year, but did not raise enough to cover the full expense of buying the show. KHSU will keep the "funky and fun feeling" of its Saturday afternoon line-up with a new program, "American Routes," airing from 1 p.m. to 3 p.m. The show, produced in New Orleans by folklorist Nick Spitzer, "explores the shared musical and cultural threads in American styles and genres of music" through stories, interviews and both recorded and live music. "Beale Street Caravan" a show produced in Memphis, Tenn., follows at 3 p.m. with an exploration of blues and other music from "this birthplace of Rock and Roll." "Beale Street" moves from its early Sunday morning time slot. The Celtic music program "The Thistle and Shamrock" will move from a Sunday evening slot to follow "Beale Street" at 4 p.m. on Saturday. A variety of talk and entertainment programs will replace the "BBC World Service" between 2 a.m. and 3 a.m. on weekdays. NPR's "Morning Edition" will now start at 3 a.m. instead of 6 a.m. and will be updated throughout the morning. Subkis notes that KHSU will still carry BBC news during "The World," which airs at 4 p.m. on weekdays. He adds that diehard fans of "A Prairie Home Companion", "Mountain Stage" and the BBC can still hear these shows on the internet by going to their websites for archives, podcasts or live streams from other stations. KHSU's children's and storytelling programs, "Redwood Earlines" and "The Whippy Dip Radio Show," previously on Saturdays at 11 a.m., will move to Sunday evenings at 6 p.m. Subkis says the change was prompted by shifts in the Saturday morning programs, but for other reasons, too. "We talked to teachers and parents about this move," says Subkis. "The suggestion was that we move these shows to a time later in the day because families and children have many Saturday activities that take them away from the radio." Both shows also feature folksongs and stories in the folk tradition, which make a good fit directly before the "Folklife Woodshed." Complete details of all the changes can be found on KHSU's website at khsu.org/program_changes. KHSU can be found at 90.5 FM in the Humboldt Bay area and on repeaters in communities around Humboldt, Del Norte and Curry counties. KHSU is licensed to Humboldt State University. Q: Why change the KHSU program schedule? A: For many reasons. Some are financial - we were paying a significant amount of money but did not have a significant audience or attract enough financial support to pay for some of these programs. Other changes were made to improve our program flow so that listeners will continue to enjoy the theme of our programming for a longer period of time. In some cases, we wanted to "put our best foot forward" and air our most popular programs at times when more people would be likely to hear them. Last, we wanted to add some new and exciting programs to our schedule. Q: I used to hear my favorite program at a particular time. Why is it now gone? A: In most cases your favorite program is not gone; it has just been moved to a different time of the week. This is especially true on the weekends. Take a look at the new schedule (link is below) and see. Q: I love "A Prairie Home Companion" and now it's gone. Why? A: We love "A Prairie Home Companion" also, but we can no longer afford it. This was the single most expensive entertainment program on the KHSU schedule. Our fees to American Public Media for affiliation and the rights to air "A Prairie Home Companion" totaled more than $21,000. American Public Media required us to air the show on Saturday afternoon - not a "prime time" for radio audience. Even with months of special targeted fundraising we were unable to break even and raise the money we needed to continue to air the program. Q: And the BBC World Service overnight? That's gone too. A: Pretty much the same reason as "A Prairie Home Companion." The BBC is an expensive program service that aired at a time when there was very little audience. In today's economy, we just can't afford to pay large fees for programs that few people can listen to. We still have BBC news on "The World," which airs weekdays from 4:00 PM - 5:00 PM. Q: Don't you have to pay for the programs replacing the BBC? A: No. There is no charge for the earlier feed of NPR's "Morning Edition," which will replace most of the BBC hours. This is already paid for with our program fees to NPR. The other early morning hours replacing the BBC are filled with programs that come to us at no charge. Q: What is new with all of these changes? A: Our favorite new program is "American Routes" on Saturdays from 1:00 PM to 3:00 PM, replacing "Mountain Stage." This program looks at many musical styles and performers as they intersect with unique aspects of American culture. It's all connected and unified through the music. "American Routes" is produced and hosted by folklorist and American music expert Nick Spitzer. Q: Why did you take "Mountain Stage" off the air? A: "Mountain Stage" was another of our shows with a noticeable price tag. It's been on the air at KHSU for many years, and many of the programs were repeats. We think "American Routes" is a good replacement with a similar appeal but a fresher sound. Q: If I can't hear "A Prairie Home Companion", "Mountain Stage" and "The BBC World Service" on KHSU, where can I hear them? A: The internet. You can go to the programs' websites to find archives, podcasts or lists of other stations that air these programs where you can listen in real time. Q: Why are you airing so many hours of "Morning Edition"? A: "Morning Edition" is an evolving program. News is always happening and "Morning Edition" is up-to-date as most of us on the West Coast are still sleeping. Night owls and early risers in the KHSU audience can now hear the timely news of the day when it first happens. NPR updates "Morning Edition" throughout the morning as stories evolve, so there is always fresh news in the later hours of the program. Q: And "Weekend Edition"? Why are you adding another hour of that program? A: Most people's lives change on the weekend. They sleep in later or do domestic and recreational activities on a different schedule than during the week. 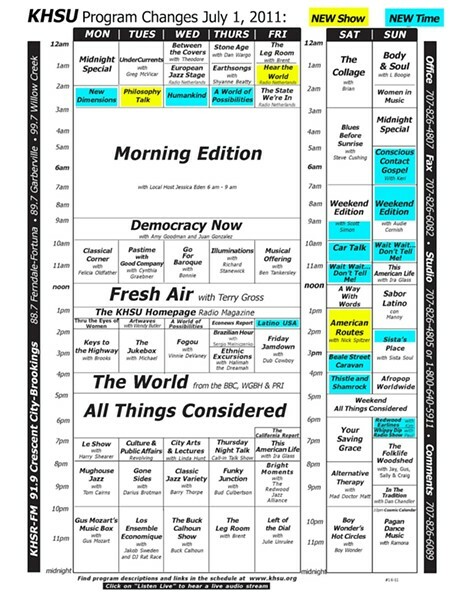 Our new schedule for "Weekend Edition" - from 7:00 AM to 10:00 AM - will allow more opportunities to hear the entire program as it accommodates weekend lifestyles. This change also makes the Saturday and Sunday schedules consistent with each other as we air the program at a regular time on both days. Q: I listen to "Wait Wait - Don't Tell Me" on Saturday. Why are you airing a repeat now on Sunday? A: You may listen to the whole show on Saturday, but as we noted above, people have busy and changing lifestyles on the weekend. "Wait Wait" is one of our most popular programs. A repeat on a more leisurely Sunday morning will allow people to hear the program if they missed it on Saturday, or if they just want to enjoy its clever humor again while news the show pokes fun at is still timely. Q: Why did you move your children's programming from Saturday morning to Sunday evening? A: We talked to teachers and parents about this move. The suggestion was that we move these shows ("Redwood Earlines" and "Whippy Dip Radio Show") to a time later in the day because families and children have many Saturday activities that take them away from the radio. We chose early on Sunday evening as the best place to move these shows for two reasons. First, the weekend is winding down by then and families tend to be settling in back at home; and second, many of the songs and stories in these programs come from a folk tradition, and what better way to tie this in than to air these shows before "The Folklife Woodshed"? A: On Sundays, "Conscious Contact Gospel Hour" now begins an hour earlier in the morning; "Sista's Place" expands an extra half-hour and now begins at 2:00 PM; and "Latino USA" moves to Friday afternoons at 1:30 PM. We'll also hear a variety of discussion, music or entertainment programs early in the AM before "Morning Edition." Q: How can I comment about programming on KHSU?